This is a sponsored post on behalf of Consumer Crafts. I was compensated for my work, but all opinions are 100% my own. 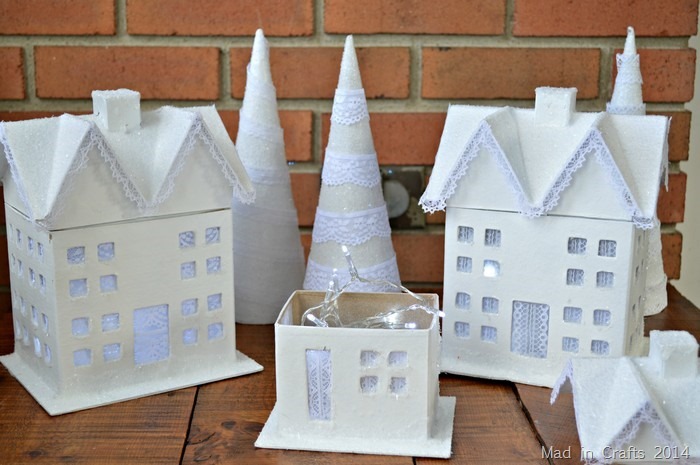 Last week I shared with you my plans to make a pretty all white Christmas village using supplies from Consumer Crafts. I am really happy with how they turned out. I used my Consumer Crafts supplies and a few materials from my stash to make a wintery village of white lace and glass glitter. 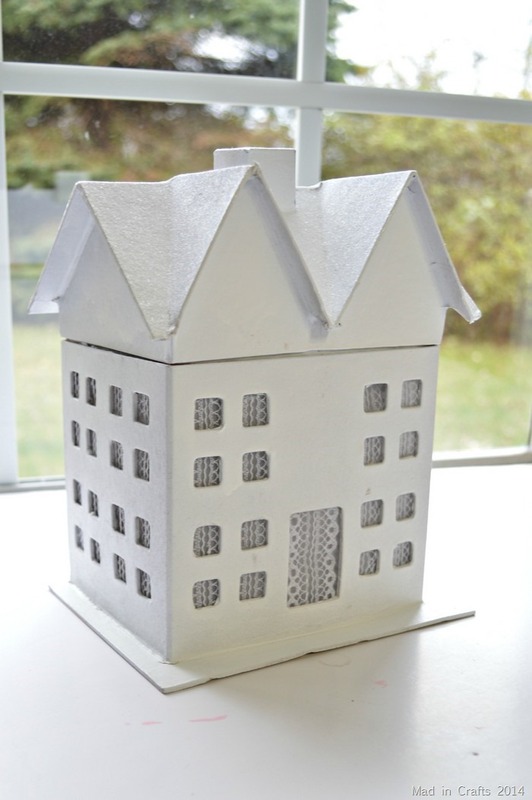 I began by giving each paper mache house and tree a coat of my trusty Plutonium Polar. 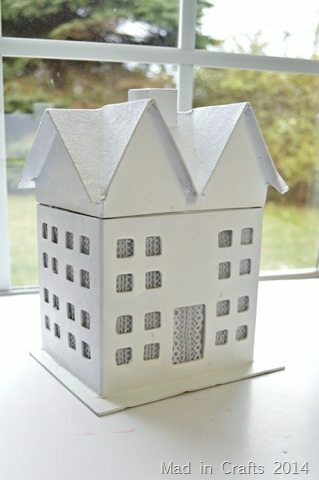 It is a true white so it doesn’t look dingy or yellow next to the other embellishments I had planned for the houses. 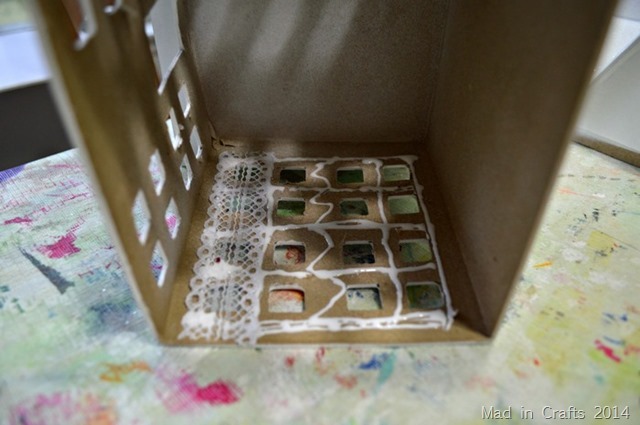 Next, I trimmed pieces of the Martha Stewart lace to cover the interior of the windows for all three houses. I used thick craft glue to keep the lace in place. 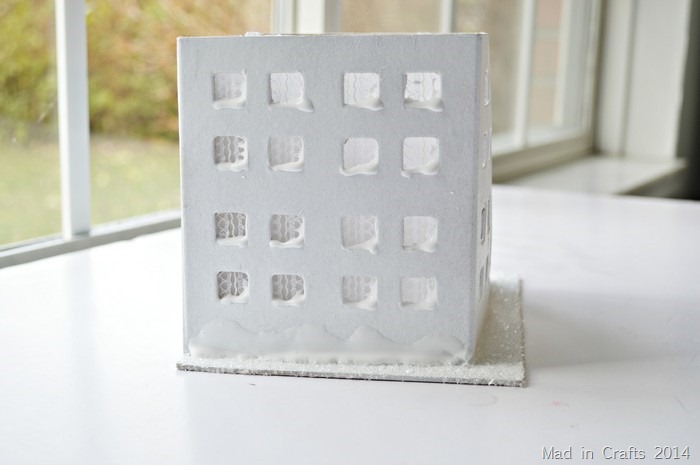 I could have left the windows like this, but I planned to place LED lights inside each house. The lace alone wasn’t enough to make sure the cords and batteries weren’t visible. I solved that problem by cutting rectangles of vellum to fit the interior walls of the houses. Again, I used the craft glue to hold the vellum in place behind the lace. 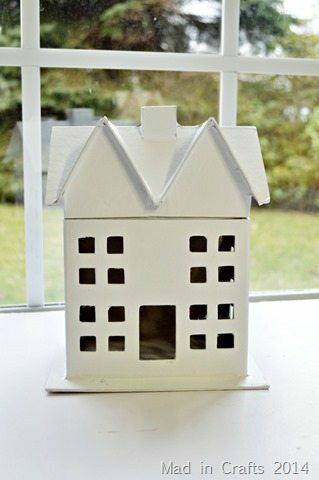 I wanted the houses to look like they had seen a good snowstorm, so I used the tip of the glue bottle to add craft glue to the bottom and right side of each window pane. It is important to use THICK craft glue here, or the glue will simply drip all the way down the side of the house. 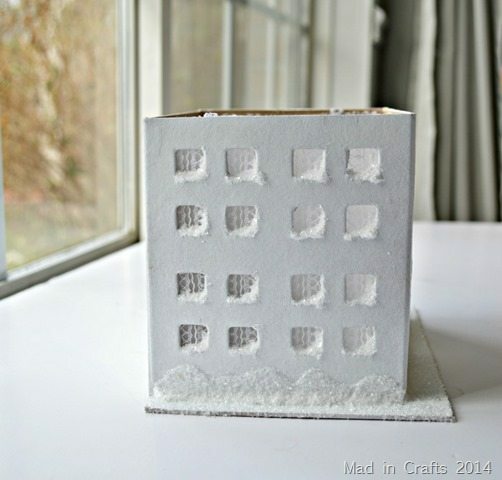 I also added some decoupage medium to the base of the houses and up the walls to look like snow drifts. While the glue was still wet, I sprinkled a generous amount of glass glitter onto the glue. TIP: Take a piece of freezer paper or parchment paper and fold it in half, giving it a good crease. Put that piece of paper in a 9×13 or jelly roll pan. Do all your glittering over it. Then you can lift the paper, fold it, and pour the glitter back into its container. It won’t eliminate the glitter mess, but it will make it more manageable. 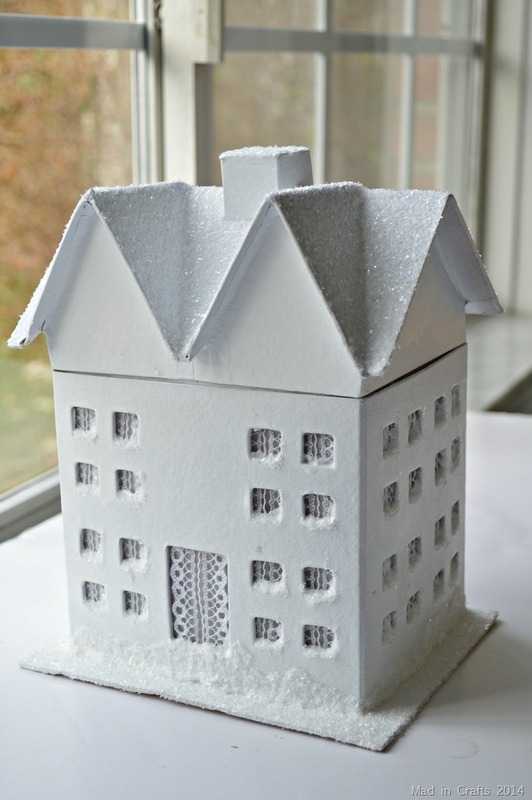 The roof and chimney of each house also got a layer of Mod Podge and glass glitter. After the glue dried, the houses got a coat of MS spray enamel to keep the glass glitter from shedding. 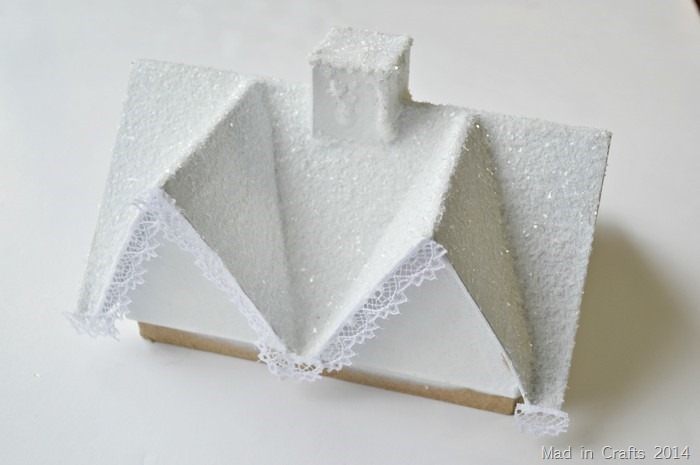 I wanted to add some lace trim to the eaves of the houses too, so I cut some of the lace trim to fit each angle. I squirted a small amount of craft glue onto the straight edge of the lace pieces. Then I carefully put the lace in place on the eaves. It was a putzy process, but not at all hard. 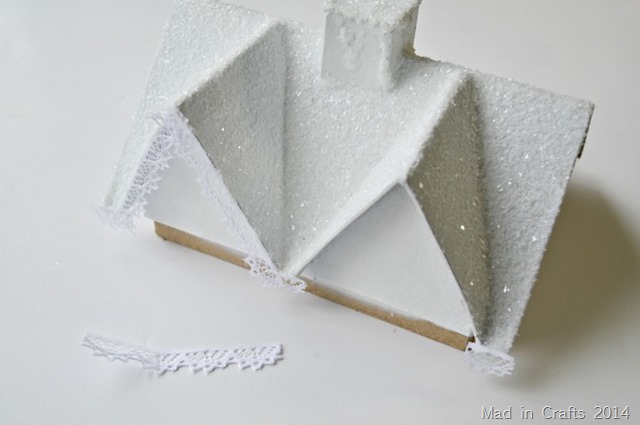 After that glue had time to dry, I trimmed any lace that overlapped the edges of the roof. Here is the village all finished! I will show you how I made those simple lace and glitter trees soon, I promise. The lace in the windows looks pretty during the day, and the glass glitter will catch any stray beam of light and throw it right back at you. Honestly, glass glitter sparkles just like freshly fallen snow. To make the village equally as charming at night, I placed a battery powered strand of LED lights in each house. Just pop the roofs off the houses when you want to turn the lights on or off. 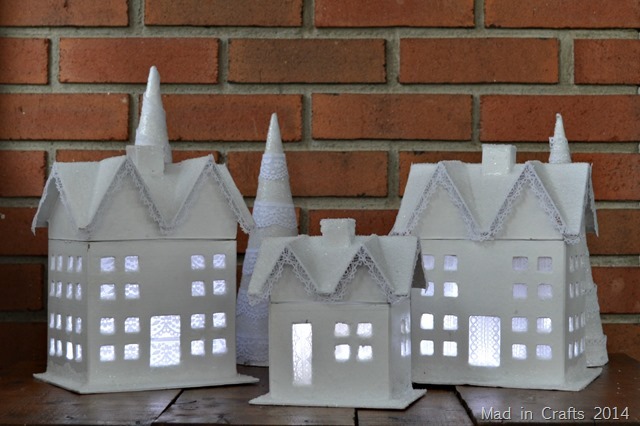 The LED lights are bright enough to illuminate the inside of each of the houses well. For the two larger houses, I taped some of the lights to the back interior “2nd story” wall so that the upper story windows were fully illuminated too. If you are thinking of starting your Christmas crafting, you should head over to Consumer Crafts to surf through all their great deals on craft supplies. 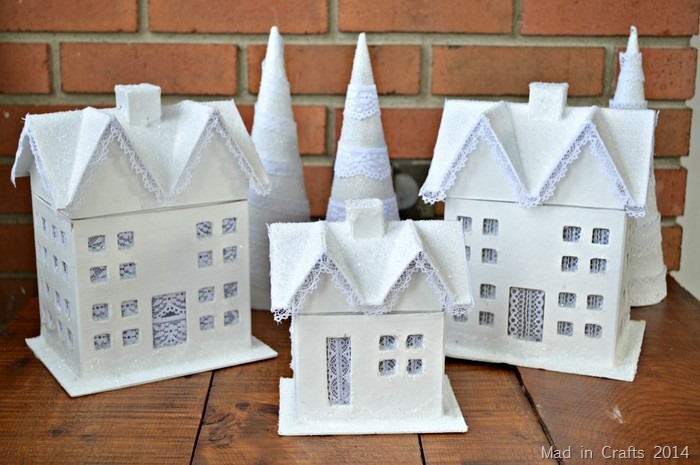 I never thought of using lace before in any craft! This is such a great idea and I love how easy it is. Thanks! I would cut fabric bows for Christmas presents! I would make baby shower invitations! Pretty! I love that you thought to put glue on the windowsills to look like snow. So pretty! I would make cookie party invites! I would make personalized tags and bows for my children’s Christmas presents. What wouldn’t I make. I love to DIY…All my friends ask to make them all kinds of projects from burlap seasonal outdoor flags, pillows, t-shirts for family reunions, stencil poster art and the list goes on. I’m so limited w/ my Cricut Mini. Since I can’t afford to replace it with something new I have resort to the printing the image on my printer and then transferring it to freezer paper…yes, yes the good old fashioned way. So I would love to win a new Cricut so I can create with endless possibilities. I really want to try my luck with appliques!!! I have no idea! I would just play with it! I need to make some presents for the ladies who all stamp together. 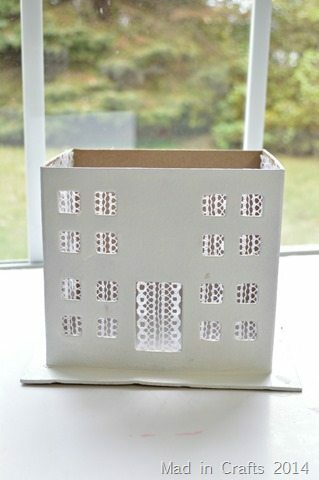 I would like to cut out a box or bag with Christmas theme so I could put candy or some other small present in it. I would make a scrapbook page. i would create birthday cards, scrapbooks, home decor and gifts. These are soooo cute. Great idea and the lace is great!! Thanks for sharing! I also forgot to answer your question…..If I won this machine…I don’t know what I would make first….the possibilities are endless. there are so many ideas floating around in my head….where do I start? I love making and sharing greeting cards. I would also love to use it more in my quilting. Ooh, if I had a Cricut Explore I would finally be set up to cut digi files! I would cut all kinds of shapes and fun goodies for my cardmaking! Jessica your village is gorgeous. 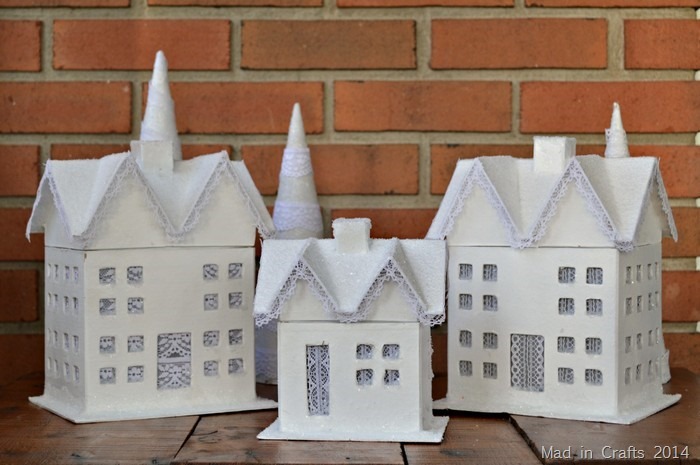 I have a thing for little Christmas houses… yours would fit right in here LOL. I want to try cutting out some leather ornaments. Love your little lace windows….never would have thought to do that one, but the look is great!! These are gorgeous!! Luckily I have all the items needed to make these and as soon as I am done entering this giveaway I am rushing into my craft room and getting started! THANK YOU for the inspiration!! I actually got happy shivers down my spine when I saw these and realized that I can get started on them tonight!! The first thing I would create with the Cricut Explore if I won it would be a thank you card for you and then I would make a banner, invites, cupcake wrappers and other goodies for my granddaughter’s birthday party!!! I am a new follower and can’t wait to get started reading your posts!! I am sooooooooooooooooo excited! THANKS AGAIN! Well if I won this wonderful prize I would first have to figure out how to use it! I’ve wanted one for so long but have never used one. It would expand my card making and paper craft hobby so much. The possibilities are endless! I would make die cuts and other embellishments for my cards and I would love to try to make this village like you did! I’d be so excited and happy if I won! Thank you for the chance! 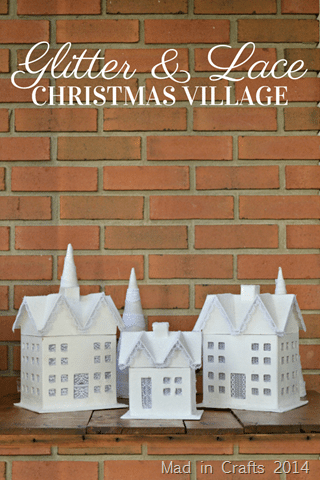 I love these little Christmas villages both the paper mache & the ceramic ones. The Epson salt with the glitter really make it sparkle when there is lights shining through. I made one of these villages for my neighbor for Christmas and she LOVED it!!! She asked me to please make another for her mom. Thank you for the inspiration!! Would love to know who the lucky winner is. Any way of finding out?